Split This Rock poetry festival is the biennial festival of the Split This Rock organization where, “[e]very two years poets, activists, and dreamers gather in our nation’s capital for four days of readings, workshops, discussions, youth voices & activism.”  I applied to their open call for workshops and was pleasantly surprised to be accepted. I had a blast presenting, volunteering, and exploring DC! excerpt of Langston Hughes poem “Big Buddy” title, author, and poem excerpt in bold white letters on a black background. Square, Split This Rock Poetry Festival name tag in square plastic case. “Donnie Welch” written in black lettering. A cartoon dalamation sticker is in the bottom right corner of the badge. My day started bright and early with a volunteer orientation. I had taken a late night flight into DC after teaching a full day and probably would have been pretty grumpy were it not for some delicious cookies baked by volunteer coordinator Tyler French. The orientation itself proved pleasant, informative, and engaging. I was impressed by the attention the festival paid to accessibility. In the lead up to the festival, I saw all the email reminders about the scent-free environment, shuttles, and requests for adapted materials, but it’s one thing to talk the talk and another to have these details emphasized throughout the festival. "People First Language" guidelines included in the Volunteer information packet. Brief introduction followed by two columns “Say This” “Not This” in black lettering on a white background. After the orientation I got ready for my session which was from 1:30pm-3pm in the Charles Sumner School Museum. An hour and half is the longest I've ever presented and I was pretty nervous leading up to the event. I was afraid that I wouldn't be able to fill the time or hold people's interest for that whole slot! I had nothing to worry about though, because my session was full of an amazing group of people. They were really game for the collaborative activity and curious to learn about my work! After being around so many educators and academics at my other presentations (no offense) it was refreshing to be around poets. There was a general sense of optimism or, perhaps more accurately stated, a “can-do” mentality. People weren’t asking me about budget concerns, common core alignment, class management strategies, and other ( admittedly valid) concerns, instead they wanted to know the poem titles poets came up, what the writing looks like, have any of my students published? It was an exciting atmosphere to be running a workshop in! 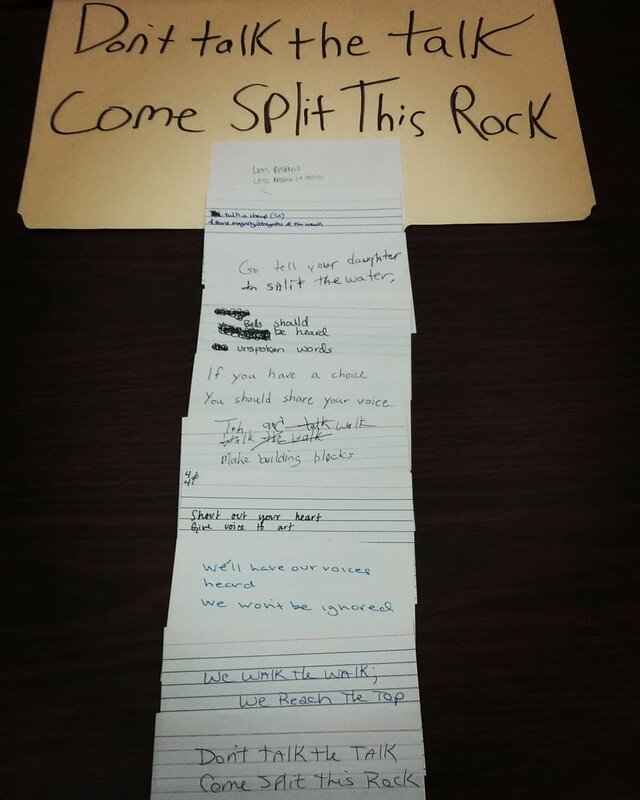 Collaborative poem made by the poets in the "Let the Words Sing" workshop at Split This Rock. At the top of a dark wooden table there’s “Don’t Talk the Talk / Come Split this Rock” written in black marker on a manila folder. Stacked vertically underneath are note cards, each with two lines of writing in pen, making up the poem. After my presentation I went over to the Deaf Poets Society reading where I heard from a line-up of incredible poets. I was especially found of piece from Jay Besemer which used some probiotic imagery ( as I've been working on a kefir poem myself) and the erasure work of Jill Khoury. The night’s feature was also incredible. Every poet who was reading was someone on my wish list of poets to hear and the Jonathan Mendoza, who opened with his Sonia Sanchez-Langston Hughes Award winning poem "Osmosis", is a familiar face from my Emerson College CUPSI days, so it was cool to see his growth and success! Festival flyer for Split this Rock. The top title is in white with black and red lettering stating the festival name. The middle of the flyer is black with white and yellow lettering to introduced the featured poets. The bottom of the flyer has a banner of red with white lettering giving the details of the featured reading. The very bottom of the flyer is white with the festival tag line in black lettering. I decided to volunteer for Split This Rock in exchange for a free festival pass. While there were presenter rates and I thought it would be fun to involve myself with the organization. I had a 11am-1pm shift at the merch table which was really quite pleasant. I’ve sold merch before for friends in bands and the experience, while a little more serious at this level of event planning, was similarly pleasant. The people coming to buy merch were in good spirits, spending vacation money (which isn’t real money) and wanting something to bring home and remember the festival by. View of the National Housing Center atrium from the merch table. In the foreground, on a table, are rolled up black t-shirts with red stripes bearing black lettering. Beyond that is an atrium with tiled floors and a tall window-like structure jutting out into the atrium space. My next shift started at 3pm, so I popped over to the Wilderness Society and saw their Ansel Adams prints. This (like so many other amazing museums in DC) was absolutely free! I definitely recommend stopping into the gallery if you have chance, it's a truly epic reflection on the American landscape. My 3pm-5:30pm shift was as a greeter outside of a venue. At this point in the festival most of the attendees had gotten a grasp of the layout, so it was pretty slow going. I went back after this shift with the intention of taking a power nap, but that turned into a bit more of an endeavor and I accidentally napped through the feature! Gathering myself up, I headed over to the open mic at Busboys & Poets. When I was younger and more involved in the Slam Poetry scene Busboys & Poets was always talked about by touring poets and older figures in the scene, so it felt fulfilling, in a manner of speaking, to attend an open mic there. I didn’t read, instead I just took in the space and listened to some of the people I had met at festival and in my workshop share their writing. The Social Change Book Fair was amazing! I spent the morning and early afternoon going from booth to booth, talking about my workshops and speaking with editors, journals, and presses both new and familiar. An open room with large windows full of tables, some covered in cloths, other bare, all with materials (books, computers, magazines) on them and with people behind them sitting in chairs or standing up. On the other side, people are walking around and talking to those behind the tables. It’s clear that its sunny outside as light is coming through the large windows of the space and brightening up the book fair scene. After the book fair, I decided to take the day to explore DC. I went to the National Portrait Gallery and saw the Obama portraits along with a number of other paintings that I recognized, but hadn’t realize were housed there. I also stumbled upon a painting I’ve been using in a reading group I run on the Sleepy Hollow legend, which was a fun discovery. Donnie Welch, a young, white male bearded, with glasses and in a black long sleeve shirt stands in front of "The Headless Horseman Pursuing Ichabod Crane" (1858 oil on canvas) by John Quidor pointing at the art. The painting is a water color showing two horsemen, one the black, spectral, headless horseman on a black horse, reared up, the other a regular man on a white horse trying to ride away. The painting fairly small and in an ornate gold colored frame. After that I walked around the city some more and finally circled back to my hotel to freshen up before the closing festivities for Split this Rock. All in all it was a great adventure. The festival was incredible and highly reccomend it to any poets out there who are interested and DC turned out to be a pleasant surprise. I was expecting a lot of tourists and powersuits, but I found myself quite charmed by the capital and excited for a return visit sometime.